History and genealogy of the Hairston, Hairstanes, Hairstone, Harston families of Scotland, Ireland and America and the descendants of Peter Hairston, who arrived in America about 1728. The Hairston family is said to be from the Dumfries area of Scotland. Handwriting from 17th century Scotland is often difficult to read, but there are Hairstanes, Hairstains, Hairstones, Harestons, Herstaines, Hairstens, Harston, Hairsteins, Hairstons, etc. listed in old records. Dumfries Customs & Excise documents indicate a William Hairstanes was in the Tobacco trade with the American Colonies in 1721. There is a 1726 farm lease between Peter Hairstons and Sir Robert Adair in Antrim County, Ireland. Peter was living in Straidnahanna, Bellyclair, a few miles North of Belfast. Peter and his family probably came to America during the 1727/1728 Irish drought. Documents found in Ireland. Peter Hairston was living in Lancaster County, Pennsylvania from about 1729 to 1739 at three different locations. Between 1739 and 1741 Peter and his family moved to Goochland County, Virginia with the Michael Woods group. Peter Hairston first appears in a 1741 road request in Goochland County. Many stories have been handed down through the years that are not based on known records. As an example, these stories mention that Peter Hairston's wife was an "Irish Lady Of Rank". How many children did they have? Is the travel trunk at Cooleemee the trunk that Peter used coming to America? 1. Did “Peter the Immigrant” or his sons fight in the Battle of Culloden, 1746? Answer is No. From the “Encyclopedia of Virginia Biography” 1915: “Peter Hairston, the emigrant as known in the family, left Scotland after the battle of Culloden, 1746, having fought on the losing side, that of the Pretender. He fled to Ireland, remained there for a short period of time, and about 1747-48 came to America, landing at Norfolk, Virginia". 2. Peter Hairston documented living in Lancaster County, Pennsylvania from c1729 to c1739. 4. Andrew Hairston listed in Goochland records in 1744, Albemarle 1749, etc. 5. Samuel Hairston listed in Goochland records in 1743-1744, Albemarle 1744, 1746, 1749, etc. 6. Battle of Culloden was fought 16 April 1746 near Inverness, Scotland. 7. 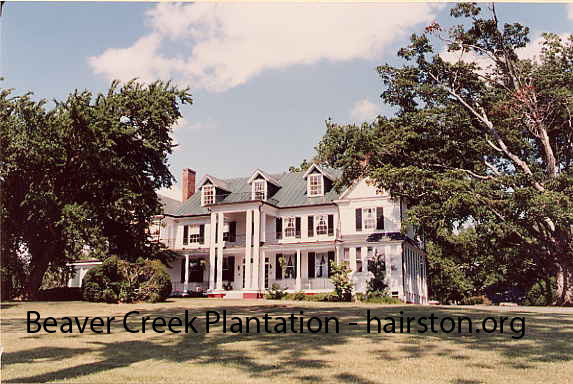 Peter Hairston listed in 1747 church records in Ivy Creek, Goochland County. 8. Robert and Samuel Hairston are in court for "breach of peace", 1747 in Albemarle County. 9. Wills of Samuel and Andrew Hairston state that Samuel, Andrew and Robert were brothers. 2. Did “Peter the Immigrant” have a son named Peter Hairston, Jr.? I have not found any original documents relating to Peter Hairston, Jr.. There is no brother Peter Jr. mentioned in the wills of Andrew, Samuel or Robert. There are no wills for "Peter the Immigrant" or a son named Peter Jr. in Virginia or South Carolina. There are no records of a Peter Jr. in the Goochland or Albemarle County Militias during the French and Indian Wars. Goochland County court records mention Andrew Hairston, Samuel Hairston, Robert Hairston and Peter Hairston, but no Peter Jr. The Albemarle County court records and jury lists from 1744 to 1748 mention Robert, Samuel and Andrew, but no Peter Jr. The Peter Hairston that purchased the 250 acres in North Garden in 1743 and then sold it in 1762 was "Peter the Immigrant" and his wife Agnes. This is confirmed in a 1940 letter that records the bible notes on the naming of the children of Jane Hairston Rentfro, the daughter of Robert Hairston (Peter the Immigrant's son). Jane wrote that she named her 5th child "Agnes", for her grandmother Hairston. The original South Carolina Hairstons were named William Hairston, Thomas Hairston, John Hairston, Peter Hairston and James Hairston. They appear to be born during the same time frame as the known children of Andrew and Robert. The idea that a Peter Jr. was the father of the South Carolina Hairston's was first proposed by Carl Greenway in a April 3, 1966 letter. Even in this letter, Carl Greenway states that his addition of a son named "Peter Jr." is based on "circumstantial evidence". Therefore, I do not believe there was a Peter Hairston, Jr..
3. Who is the father of the South Carolina Hairstons? At this time I do not have any documentation about who is the father the Hairstons that went to South Carolina - William Hairston, Thomas Hairston, John Hairston, Peter Hairston or James Hairston. "Peter the Immigrant" had three sons, Andrew, Samuel and Robert. Peter's son Robert was literate and his family is fairly well documented in bibles, records, etc. Samuel was literate and appears not to have married or had children. Andrew signed with an "X" and it appears could not read or write. I do find it interesting that the wills of Andrew and Robert mentioned a total of 15 daughters and 3 sons. We also know 2 of Andrew's sons died before he wrote his will, giving us a total of 15 females and 5 males assumed to be children of Robert and Andrew. The normal birth ratio of males to females is about 1:1. Therefore, it is possible we are missing about 10 males. There are many possible explantations including infant mortality. But, it is also possible that these missing sons moved to South Carolina. Obviously, more research is required. If you have knowledge of any documents pertaining to the Hairston family before 1780, please let me know. Any help is appreciated.